The T-90S main battle tank (MBT) is a new-generation hi-tech weapon system developed drawing on century-long experience gained in world and Russian tank-building industries, lessons learned from combat use of tanks in various countries around the world, studies and analysis of their field service and intensive trials in the most severe environments. The T-90S is a tracked combat vehicle featuring lethal armament, advanced fire control system, heavy armor protection and high maneuverability. Its main armament is a 125mm increased-accuracy smoothbore gun with a built-in boresighting system and a quick-release barrel. The gun is stabilized in two planes and is loaded by an autoloader. The autoloader ensures a high rate of fire (up to 7 to 8 rounds per minute) which favorably distinguishes the T-90S from most of foreign MBTs. The ammunition load includes high-performance APFSDS, HE and HEAT rounds. The tank gun’s capabilities to engage ground and low-level air targets have been enhanced through the use of a guided missile system: a laser-beam-riding HEAT missile is chambered by the autoloader and then fired by the gun. A 12.7mm roof-mounted machine gun enables the commander to deliver pinpoint fire on air and ground targets using remote control actuators. The tank is fitted with an automated fire control system allowing the gunner and the commander to effectively fire the gun, coaxial machine and antiaircraft machine gun at the halt and on the move, day and night. 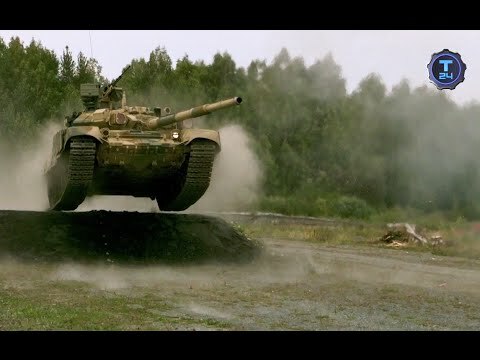 The T-90S features unrivaled 4-level protection: a low silhouette and small side and front areas; an electro-optical countermeasures system; composite armor; general-purpose explosive reactive armor. Its high cross-country capacity, mobility and maneuverability are ensured by a powerful diesel engine, a reliable running gear, manual transmission with hydraulic steering actuators, a deep-water fording kit, and tracks that can be fitted with rubber pads. The T-90S boasts the highest structural reliability. It has built-in self-entrenching equipment, can be fitted with mine-clearing equipment and transported by all means of transportation.